"An extremely easy appetizer that keeps them coming back for seconds." Preheat oven to 350 degrees F (175 degrees C). Line a large roasting pan with foil. Shape ground beef into golf sized balls. Arrange them on the large roasting pan. Bake the meatballs for 20 to 25 minutes. While the meatballs are baking, combine the jelly, chili sauce and lemon juice in a Dutch oven. When the meatballs finish cooking add them to the Dutch oven. Cover the oven and simmer on low for 30 minutes. Serve the meatballs hot. See how to make the best party meatballs. The sauce is good, but next time I wouldn't bother to make the meatballs, I'd just use ones from the store as well. 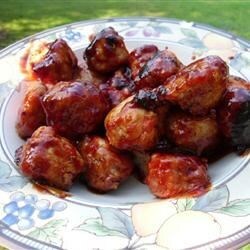 I used store bought meatballs and used one jar of Chili Sause and one jar of grape jelly with a tad of lemon juice in a crock pot and they turned out great. Variation: Seedless raspberry jam instead of grape. My family has used this recipe for years (with store bought meatballs). Guests always love them!